TOP SELLER! At first glance, this pullover looks like a knit or a sweater. 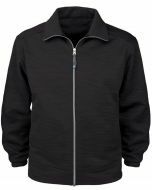 But at first touch, it becomes apparent this luxurious soft-shell fleece has been sublimated to look like a knit. At only 8 oz, water and wind resistant, and incredibly soft, this is THE fleece you'll to wear year round. Also available as a full zip. Both the quarter zip (shown here) and the full zip are available in our Wholesale Program. Great for your sales teams, service teams, and as corporate gifts.